Hello. I am finally stirring from my winter slumber, and the over indulgences of Christmas! The shortest day has been and gone, and we can look forward to warmer weather next week. The highlight of the birds seen in the park this winter is the Waxwing (bombycilla garullus). A winter visitor from Northern Europe: a beautiful bird indeed: listen out for them flying over with a soft jingling call. There are also a lot of Goldfinches around, and some superb Bullfinches. The male is a stunner in his striking red and black plumage. I continue to see the Red Kite; even flying around in heavy snow; probably seeking victims of the Arctic conditions. I have often wondered where the nearest Arctic hares are to Guiseley (Chevin area, please) as I would love to see one in the area ! I have seen Ermine (stoat in a winter white coat) on 3 occasions locally, but not in the park; the nearest been West Chevin and Hawksworth Moor. I had a report of a badger seen last year in the park. Has anyone else seen one ? And a strange report of a grey Heron dancing on a roof on Kelcliffe Lane from Chris Parapia (photos to prove). Possibly dancing for its dinner, or maybe the fact that Chris had the heating on so high that the ridge tiles on the roof were too hot for the unsuspecting Heron !! 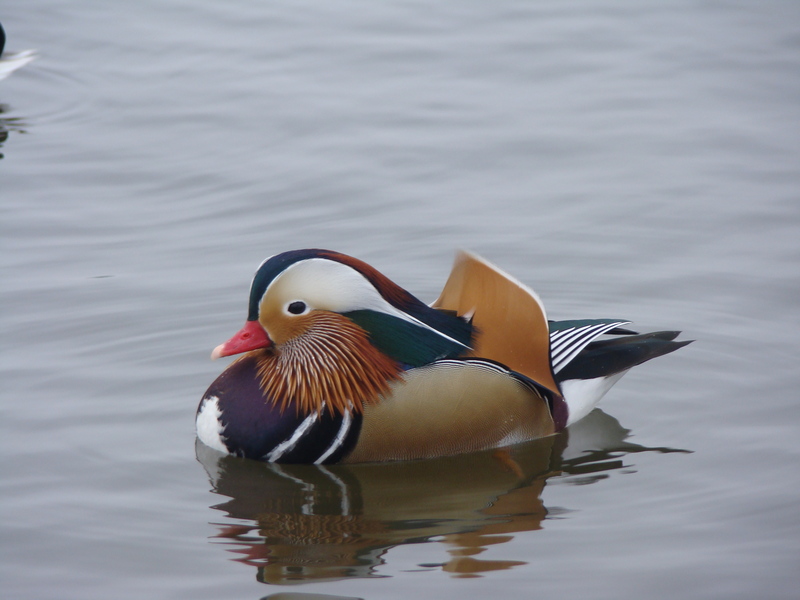 Finally if you want to see the most beautifull duck in the world,there is a Mandarin on Yeadon Tarn. This entry was posted in Bird Watch, Ecology and tagged Arctic hare, heron, mandrin duck, Red Kite, waxwing. Bookmark the permalink. Another excellent post from the knowledgable Mr Shepherd, the Red kites are indeed a common site around Aireborough now, I saw one circling the cross in Towngate last Saturday lunchtime, perhaps waiting to pick off the lunchtime stragglers from the Woolpack? the tawny owls were also in full voice on a clear frosty evening a few nights ago. Has anyone seen the Little owls on Fairy Dell in the recent past?